Some people believe that farmers lead a quiet life pottering about on their farms and working in gentle rhythm with the seasons – but there could be nothing further from the truth! Farming has changed. Today farming is a highly modernised system relying on new technologies and up-to-the-minute information. This creates a lot of pressure in one’s environment if it’s not managed properly. On an almost daily basis a farmer will wear a number of hats as he is a soil scientist, veterinarian, mechanic, meteorologist and businessman. He is also a health and safety expert, labour relations manager and accountant…even an expert sales and marketing manager. A farmer is CEO and CFO of a multi-faceted business in a dynamic environment. New developments, new systems and new regulations confront him on a daily basis. This is why it is important for farmers to stay PLUGGED IN to networks which he can turn to for support, skills development and training. This is true for EVERY farmer not only developing farmers! Partnerships will always be a necessary part of your farming enterprise. Even Bill Gates acknowledges the importance of building a business by forging helpful partnerships. He believes his success is directly attributable to the fact that he surrounded himself with good people who made it possible for him to build a firm foundation and upscale quickly. With other people involved you think smarter. Gates also says he looked for people who would complement his strengths and make up for his weaknesses. It’s unrealistic to expect yourself to acquire ALL the skills necessary to do farming. Choose your community of support carefully. Gather people around you who respect you and who you trust. And keep them accountable. Networks are a great way for farmers to exchange information, socialise, learn and connect with fellow farmers. But networks also extend to relationships with stakeholders: A farmer forges ‘partnerships’ with financial institutions like banks and agribusinesses, input suppliers of fertiliser, seed and chemical and other farmers. Who do you look to for advice? Who do you allow to mentor you? Who do you need a good working relationship with? These are your ‘partnerships’. 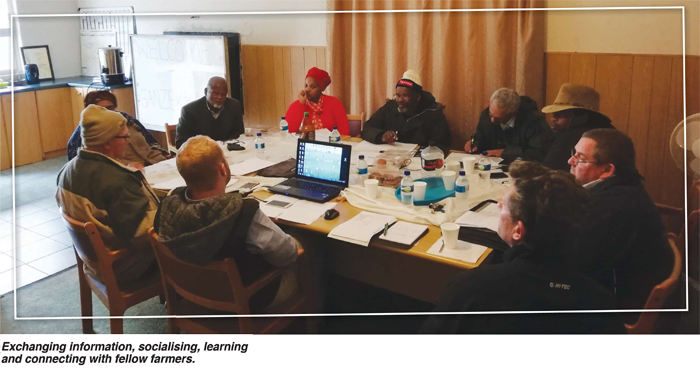 The Grain SA Farmer Development Programme is also a partner with many developing farmers. The common goal is to help farmers farm sustainably and produce top yields using best practices. The program has been carefully structured to create an environment for farmers to learn more and to learn fast. The Study Group is the heartbeat of the development programme. It is there where we meet new farmers and where the farmers learn that we are genuinely interested in helping them in a non-threatening environment. The Advanced Farmer Support Programme is designed for farmers moving towards commercial farming. Expert mentors get to walk beside them and offer advice. The Pula Imvula magazine is an important tool which aims to spread a wide net of information. Important messages are conveyed so farmers are better informed. We trust the messages in the magazine reach many ears and serve to inspire future farmers. The training courses have been specifically designed to up-skill farmers as knowledge gaps are identified. The courses have both theory and practical sessions to ensure the learning is meaningful and useful. We aim to provide each member with a supportive environment and the opportunity to equip themselves better for their farming. How does one build a meaningful network of partnerships? Partnerships are a two-way process. There has to be mutual respect – even if you don’t always agree on everything. Not every partnership will last forever – some are forged for a particular reason in a particular season. It is also important to recognise that not all partnerships work. You must feel free to walk away from a partnership that is not helpful to you. What are the characteristics of a good partnership? Honesty – there can be no effective partnership where someone is pulling the wool over another’s eyes. We need to tell others why we wish to partner with them and the other parties need to be clear with their reason for wishing to partner with you. The farmer must ensure he selects well qualified experts who operate at a high level of integrity. The best way to know if a person can be trusted is to talk to other people who have had business dealings with them. Supportive – there needs to be solid support for each other and for the common goal. A partnership cannot be successful if the behaviour is bossy, manipulative or has a weak link in any way. Commitment to the goal must come from all involved regardless of size or strength. Experience – it’s important that there is a level of expertise within the partnerships. This is not the place to have the blind leading the blind. Choose partnerships that add vision, knowledge or empower you. Clear communication – there can be no confusion about what you want to achieve. Everyone must understand their responsibility. Make sure you understand everything discussed and everything you sign. This is where you benefit from building a spider-web of connections in the sector. It is not always a good idea to depend on only one person for guidance. Keep your eye on the goal – be clear about where you are taking yourself and your business. Ask yourself what you wish to achieve. When the goal is achieved you may end that partnership or refocus on new goals. Service – successful partnerships are based on service, not selfishness. Not one person does all the work, nor is any one member seeking more recognition than the others. There is no hidden agenda. Talk about your concerns, talk about your joys and share your hopes. Don’t let your network forget you. Pitch up and be reliable. When a strategic partner has a comfortable relationship with you they will be more likely to seek solutions for challenges and be supportive of you. Remember: If you want to go fast, go alone but…if you want to go far, go together!